This Ancient East Tour explores 5,ooo years history in 5 days. 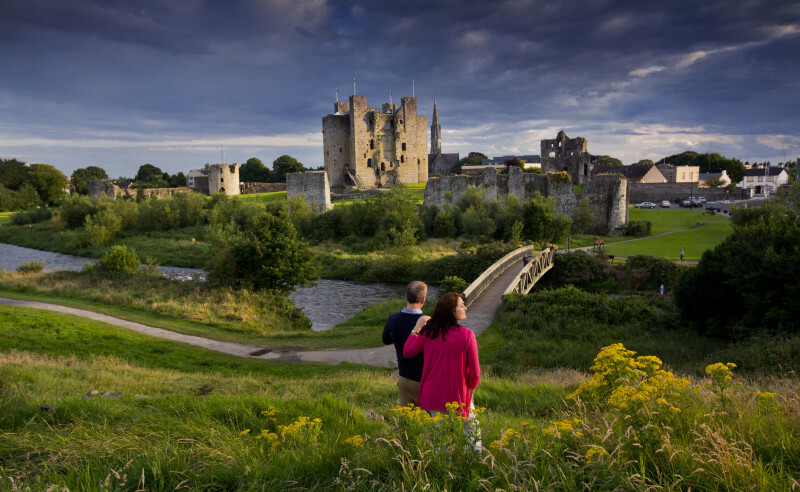 See amazing castles in Ireland as well as many other historical landmarks along Ireland’s Ancient East. Now is the time to visit Ireland! Your journey of discovery in this relaxing, off the beaten track, lush beautiful landscape, that attracted warring settlers for millennia, will be made awe inspiring by stories from the best story tellers in the world. There’s an engaging authenticity to life in the local, bustling towns and villages. Take in a festival; try local fresh produce or tasty local specialties, many of which trace their roots to ancient times. Drive leafy roads through lush rolling valleys. Explore meandering rivers or the mountains that once protected the original inhabitants. You will leave not only refreshed but illuminated by these many ancient wonders and the stories of how they came to this rich land and how Irish life today has been shaped by their immensely powerful influence. Depart Dublin early morning for the Boyne Valley which was once Ireland’s ancient capital and it’s most sacred and mythical landscape. First stop should be at the Hill of Tara, located between Navan and Dunshauglin. What better way to get a view of the country as it is said that a quarter of the landscape of Ireland can be seen from this hill? Though best known as the seat of the High Kings of Ireland, the Hill has been an important site since the late Stone Age when a passage-tomb was constructed but Tara was at the height of its power as a political and religious centre in the early centuries after Christ. 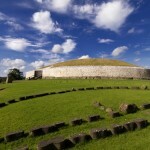 Continue north east to the Valley’s most famous attraction Brú na Bóinne, an UNESCO World Heritage Site, and Newgrange being the most famous of its megalithic tombs. But go off the beaten track and find yourself interweaving and being surrounded by the tombs at Knowth and Dowth which are equally as impressive. Take time to wonder at how they could have been engineered and constructed based on the surrounding landscape, sun and stars. Stop off for lunch in the picturesque village of Slane before continuing west to the Loughcrew Cairns. After lunch, continue west to the Loughcrew Cairns, also known as the Hills of the Witch, which are a group of Neolithic passage tombs dating to 3000 BC. It is possibly the oldest cemetery in the world. It contains some of the most beautiful examples of Neolithic art in Ireland. During the Vernal and Autumn Equinox people gather at dawn in Cairn T to watch sunlight enter the chamber and illuminate the inside of the tomb. But it’s also a lovely place from which to sit and watch either the sun rise or set over the lush green landscape and to imagine what life was like for Ireland’s forefathers. Travel to Athlone to overnight. Make sure to visit Sean’s Bar which is the oldest bar in Ireland and also does music. Experience what it must have been like to be a Viking with Viking Tours and travel by boat up river through the Irish landscape and come upon the sacred site of Clonmacnoise. This settlement was a major centre of religion, learning, trade, craftsmanship and politics, thanks in large part to its position at the major crossroads of the River Shannon (flowing north-south) and the gravel ridges of the glacial eskers (running east-west). 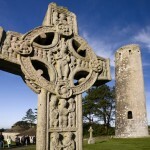 It is also where Pagan met with Christian Ireland with High Crosses depicting stories of both. It was also once the home of 1,500 monks who prayed, studied and crafted great treasures such as the Crozier which is visible today in the National Museum. About 10kms away from Clonmacnoise is the small village of Ballinahown and you will be able to get a bite to eat before your journey south. The road from Ballinahown to Cashel wanders through the heritage towns of Birr (home to Birr Castle), Roscrea with its Cistercian abbey and also Thurles, the reputed home of hurling which is the fastest field sport in the world. Just outside Thurles, Holycross Abbey was founded in 1168 for the Benedictines by the King of Munster, Donal O Brien. A particle of the True Cross was enshrined (and still remains) in the abbey, and subsequently Holycross became one of the most frequented places of pilgrimage in Ireland. It was a very prosperous abbey and several of the Abbots were peers of Parliament. In the 1970s the Abbey was restored and a local guide will bring you around the abbey and explain how today it still plays such an important part in local life. 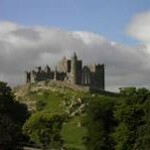 Only a short distance from Holy Cross is the impressive Rock of Cashel which stands on a rocky outpost surveying the land which surrounds. Powers, be they royal or religious, ruled here for 1,200 years which demonstrated the importance of this site and from where the spiritual life of the south of the country was overseen. A short stroll from the Cathedral is the Bolton Library with its impressive Cathedral Chapter House which has early copies of Dante and Machiavelli, presumably for the Archbishop to consult. Stay locally in the area in either Cashel or Clonmel. If in Cashel, do spend the evening at Brú Boru situated at the foot of the Rock, where there are ssummer shows of traditional music and song and in winter, music classes and other events. Begin your day by travelling along the Butler Trail which traverses the winding River Suir Valley, through the towns of Cahir and Clonmel. Tales of romance, intrigue, frolics and fun featuring Kings and Queens, Dukes and Earls, can be heard. Spot the cannonball in the walls of Cahir Castle and a romantic stroll along the river leads you to the hidden gem of Swiss Cottage. If you’re feeling peckish, call into Hickey’s Bakery & Coffee Shop in Clonmel before heading to Carrick on Suir to view the house built for a queen at Ormond Castle.Fully replenished, wander around the Viking Triangle, look at the vaults underneath and wonder at the treasures overhead in the Museum of Treasures. Or you could also take a one or two hour cruise along the River Suir and see, among other things, the quay which was once dubbed the ‘Noblest quay in Europe’. At night, the well-known Tannery Restaurant is always an option or you could try the Bodega Restaurant & Wine Bar. Another casual option is The Munster which is possibly Waterford’s oldest pub as there has been a tavern on this site for the past 350 years.Afterwards, if you’re looking for traditional music, The Reg has music most evenings. Rather than travelling via motorway to the Medieval Kilkenny, travel through New Ross and look at the 1840s Dunbrody emigrant ship with its costumed animators and theatrical style interpretation of Ireland’s famine story. Via the pasturelands of the valleys which surround the River Nore, travel through picturesque villages of Inistioge and Thomastown. Stop off in Inistioge for a cuppa in the Circle of Friends Café (made famous by the film) and if time permits, visit Tunde Toth Papermaker to learn about the art of papermaking (by appointment only). is Kilkenny Design Centre where you can see local craftspeople at work. For the more active, you could either rent a bike or go on the Medieval and guided cycle tour of Kilkenny which will bring you along the back, slips and side streets of this wonderful city. At night, there are so many good restaurants that it could be difficult to choose. For fine dining there’s Zuni’s and for more casuall dining there’s Kyteler’s and The Marble bar at Langtons. Both also offer traditional music at night. After an early morning stroll along the river Nore, drive 60km or so north to Emo Court, in Co. Laois. The house is a magnificent example of the neo-classical style and is surrounded by beautiful gardens and parkland which were first laid out in the 18th century and contain formal lawns, a lake and woodland walks with many very fine trees and shrubs. It also has a lovely coffee shop – perfect for a mid-morning snack after wandering around the grounds. In nearby county Kildare is the Irish National Stud and Japanese Gardens. The land of the horse has long been associated with Ireland and the country prides itself on a history of world famous thoroughbred breeding. Come and see some of the stars of this world; the stallions who can be admired alongside protective mares, frolicking foals and athletic yearlings. Under an hour’s drive from the National Stud is Russborough House in Ballymore Eustace, in the garden county of Wicklow. Before visiting the house, you could stop off for lunch at the Ballymore Inn in the village or alternatively head to the Tea Rooms in the house. As well as beautiful grounds, a maze, sheep dog demonstrations and horse and carriage rides, Russborough house offers a wonderful and fun insight into the lives and stories of the aristocrats who came to party, hide and hang out in these beautifully furnished rooms. Return to Dublin that evening after your time journey through Ireland’s Ancient East. An Early Christian site founded by St.Ciarán in the mid-6th century on the eastern bank of the River Shannon. The site includes the ruins of a cathedral,seven churches (10th -13th century),two round towers, three high crosses and the largest collection of Early Christian grave slabs in Western Europe. The original high crosses and a selection of grave slabs are on display in the visitor centre. The long and varied history of Clonmacnoise is recounted in an audio-visual presentation shown in the visitor centre. important features of the monuments and Knowth has nearly 30% of all megalithic art in Europe. According to UNESCO it represents a masterpiece of human creative genius. 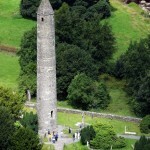 One of Ireland’s most iconic attractions, the site comprises a spectacular group of Medieval buildings set on an outcrop of limestone in the Golden Vale including the 12th century round tower, High Cross and Romanesque Chapel, 13th century Gothic cathedral, 15th century castle and the restored Hall of the Vicars Choral. Attractions include an audio-visual show and exhibitions.